After a steep and careful drive over (and through) the Rocky Mountains we made it back to “civilization”, so to celebrate, our first outing was to the nearby Costco to get our staples. No longer can we buy truckloads of toilet paper, but Costco does have a few things that we can rely on without overflowing Rover. We do know how to party hearty! 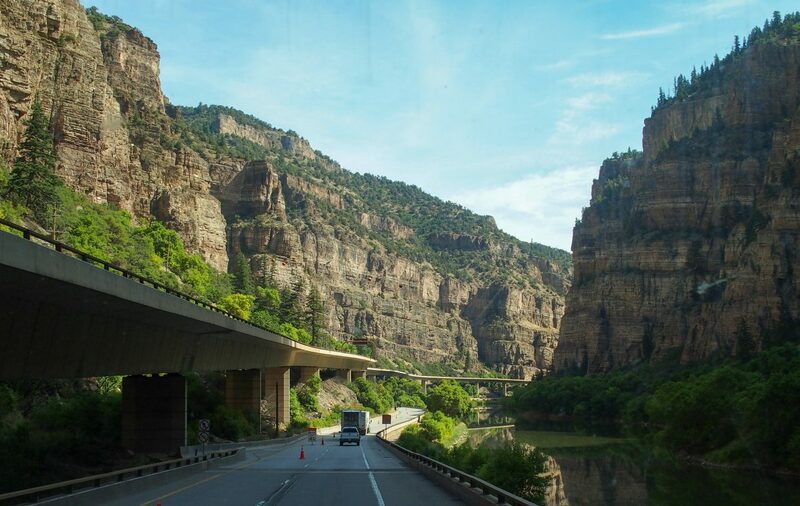 Heading through the Rockies on I-70. 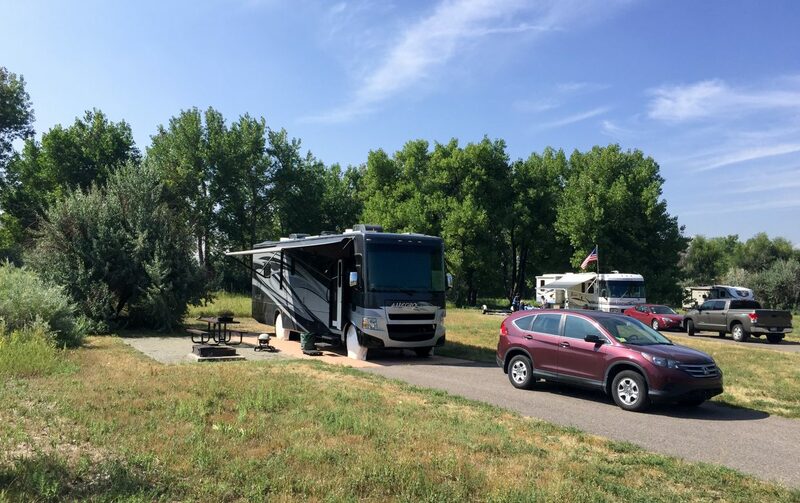 Thanks to Mike’s extensive planning, we were able to score two weeks at Cherry Creek State Park, then another two weeks at Chatfield State Park. Both are highly rated and just outside of Denver, and sell out far in advance. While we liked both of them, we definitely preferred the vibe at Cherry Creek. Chatfield felt more quiet and we almost never saw anyone outside of their rigs. Cherry Creek felt more friendly and welcoming. Our home for two weeks at Cherry Creek State Park near Denver. One great feature is that both parks have outstanding dog parks. 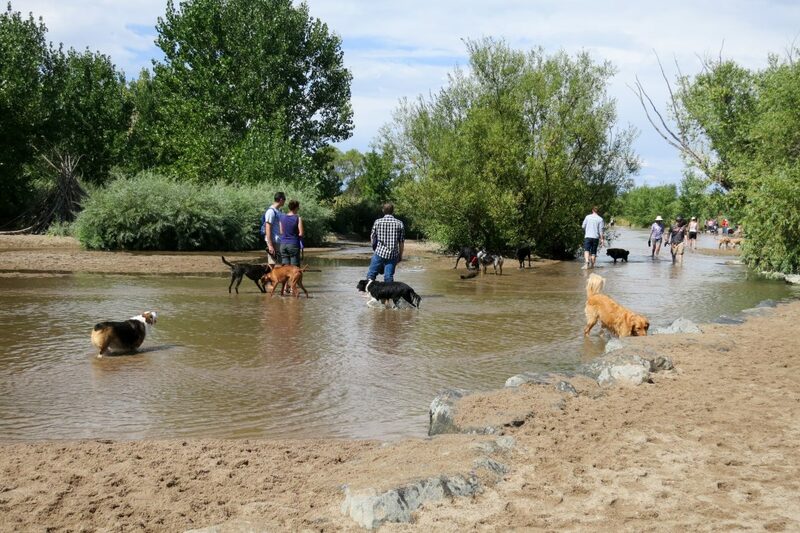 Cherry Creek’s dog park is 107 fenced acres with access to a wide, shallow, flowing river, while Chatfield’s dog park is 69 fenced acres with multiple lakes. Both dog parks charge a $2 daily entry fee, or you can buy a $20 yearly pass good at both parks. The parks have a lot of wild tall grass with dirt trails carved throughout. Opie loved running free, getting wet, marking all the popular spots, and pestering the other dogs (for some reason, he’s become recently enamored of Bernese Mountain Dogs). There is something wonderful about watching a dog running about and being a doofus. Exploring Cherry Creek Dog Park. We also did some socializing (a rarity for us) while at Cherry Creek. RVillage introduced us to Ben & Lanni, another couple who recently started full-time RVing and were camped a few rows down from us. It turns out we have very similar backgrounds (techies) and interests (gaming, sci-fi, etc.) so we had a great couple of days hanging out with them. Since we all enjoyed playing tabletop games we had a blast introducing them to Munchkin Fu (they were already fans of the original Munchkin game) and Gloom while drinking wine and snacking. We’re hoping to cross paths again this winter while we’re both in Florida. We also spent a lot of time visiting with our friend James who recently moved to Denver from the Washington DC area. He was a wonderful host and let us send him all our Amazon deliveries, plus he made us some amazing dinners, including a WHOLE steak for Opie. Opie loved him lots and lots! Checking out downtown Denver while walking to dinner with James. 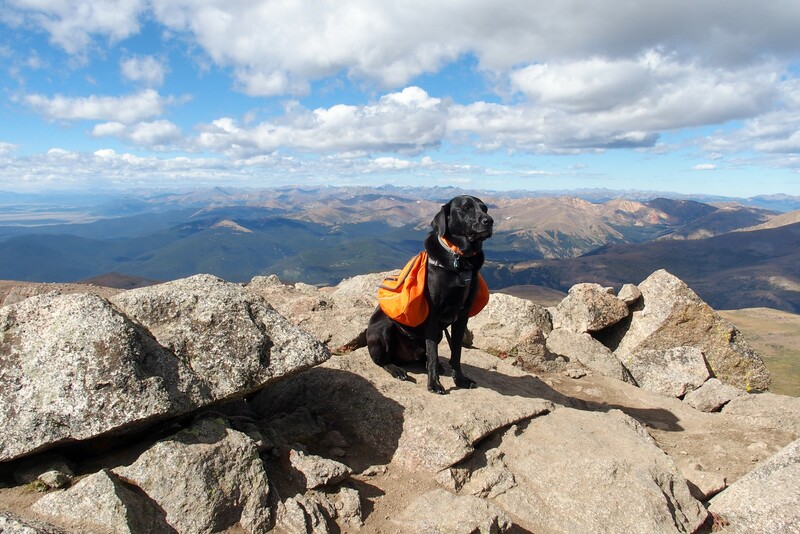 James loves the outdoors and avidly hikes the 14ers in Colorado. 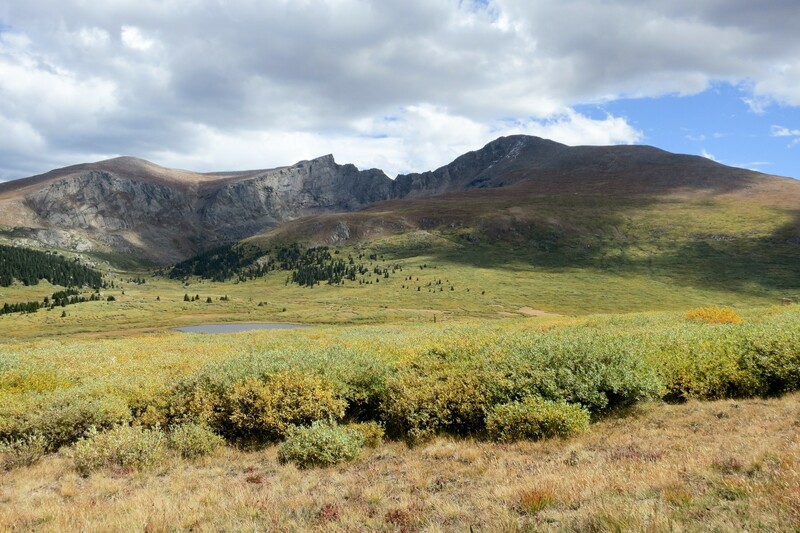 A 14er is a mountain with a peak over 14,000 feet in elevation. There are 58 14ers in Colorado and I think James is trying for all of them! 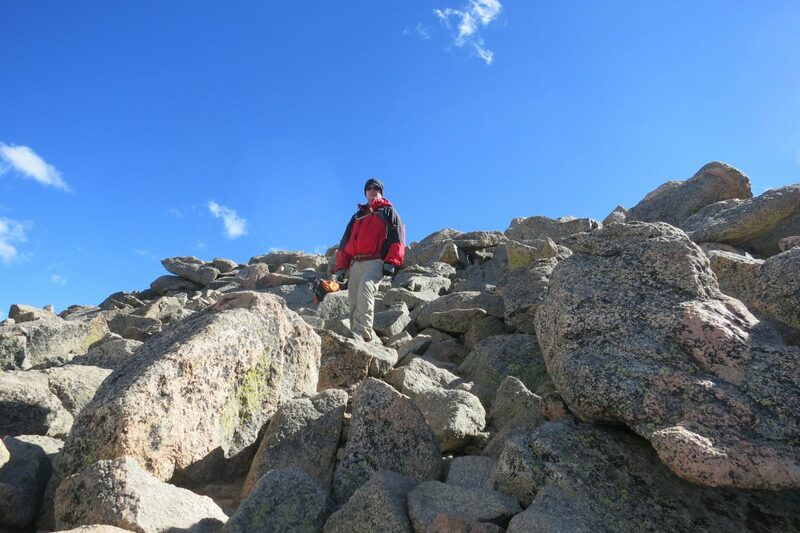 He’s so passionate about hiking 14ers that his enthusiasm rubbed off on us. After some research, we settled on trying Mt. Bierstadt, known to be the easiest of the 14ers in CO. It’s so popular that it tends to get very crowded on weekends and holidays. We wisely waited until the Tuesday after Labor Day and only saw around 30-40 people. Getting started on the Mt. Bierstadt hike. Mt. Bierstadt trailhead starts at 11,669 ft which is higher than any peak we’ve finished and ends at 14,060 ft with a round-trip of 7 miles. Seven miles and 2400 feet elevation change is normally doable for us but it’s a whole other ballgame at that altitude! James recommended an early start since storms often hit the mountains in the early afternoon. We set our alarms for an absurdly early wake-up, made the 90-minute drive from our campground to the trail head, and were geared up and on the trail by 6:45 am. We brought more water than usual so we wouldn’t get dehydrated with the high altitude, which meant Opie had to wear his hiking backpack as well to carry his share of the water. As we started up the mountain, the views were breathtaking, in this case, literally! The higher we went, the harder it was to catch my breath. By the time we were 3/4 of the way up, I had to stop every 30-40 feet since I was gasping like a fish out of water. Opie had no apparent issues with the altitude and was happily trotting back and forth. I’m positive he hiked twice the distance we did, as he would walk in front of us, then come back to check and see why we were taking so long. The final 250-feet of climbing was the hardest. The final 250 feet of climbing involves a fair bit of rock scrambling, which Opie found to be challenging. Rock scrambling is exactly what is sounds like, climbing around and up large boulders with no real path. A few times Opie would get stuck so we would have to use his pack/harness to help him move forward. 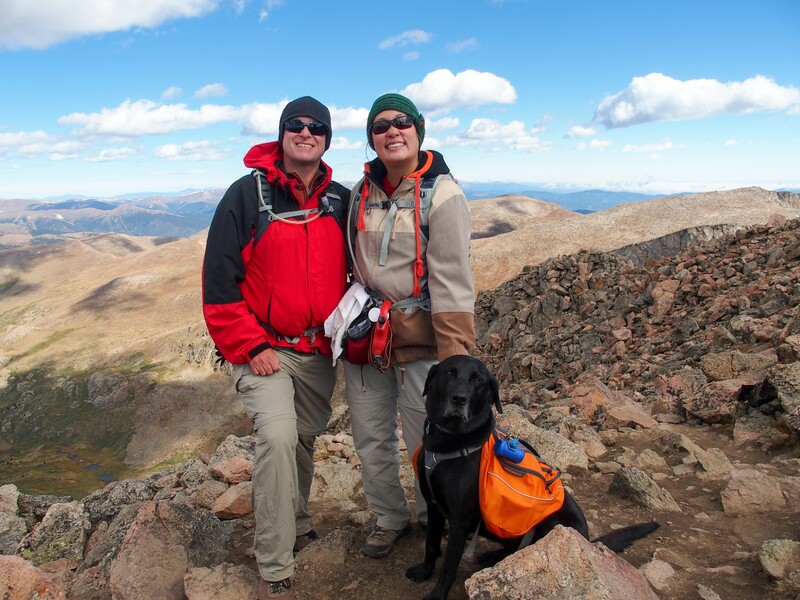 We made it to the summit, enjoyed the view and took a quick lunch to gain back some calories (yes, Opie included). The grey clouds starting moving in, so we didn’t spend too much time at the top before heading back down. We made it to the summit, 14,060 feet! The way down was a lot easier but definitely tough on the knees. Just to add insult to injury, the last mile back to the parking lot is ALL UPHILL! By this time Mike and I were exhausted (Opie was only half-tired) so that last mile just really tested us. The hike took us 6.5 hours and while we’re glad that we did do a 14er, I think that might be the last one for us (at least for a while). The hike itself is moderate and the views are stupendous. If the hike was 3,000 feet lower, I would have loved it. Apparently I’m addicted to oxygen and really really need it so the lack of air at the high elevation really made me cranky. 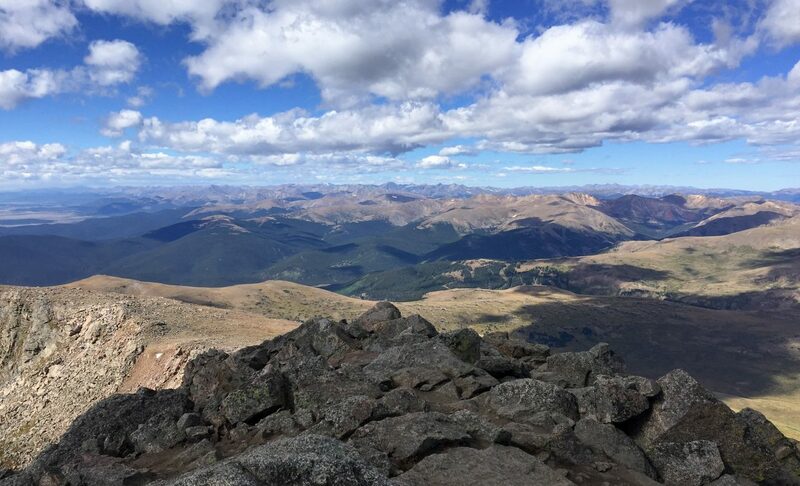 I truly admire the athletic ability and endurance of all those that regularly do 14ers. They are tough! Everything the light touches is Opie’s domain. 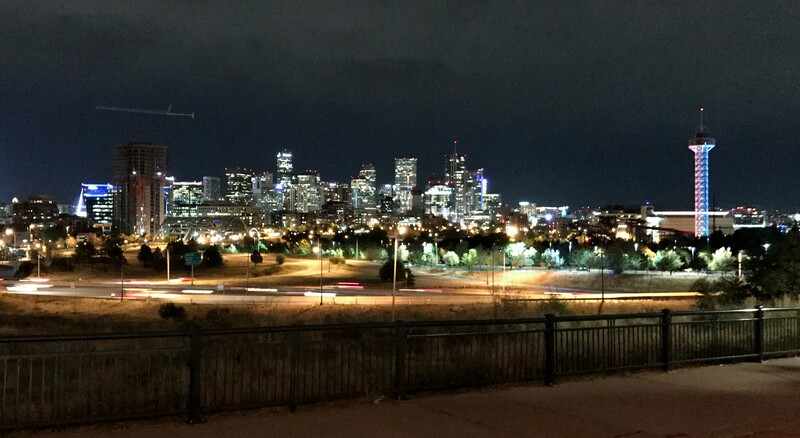 While we didn’t do much in Denver proper, we really enjoyed our time meeting up with new and old friends, conquering our first 14er, taking Opie to the dog park, and exploring the state parks. 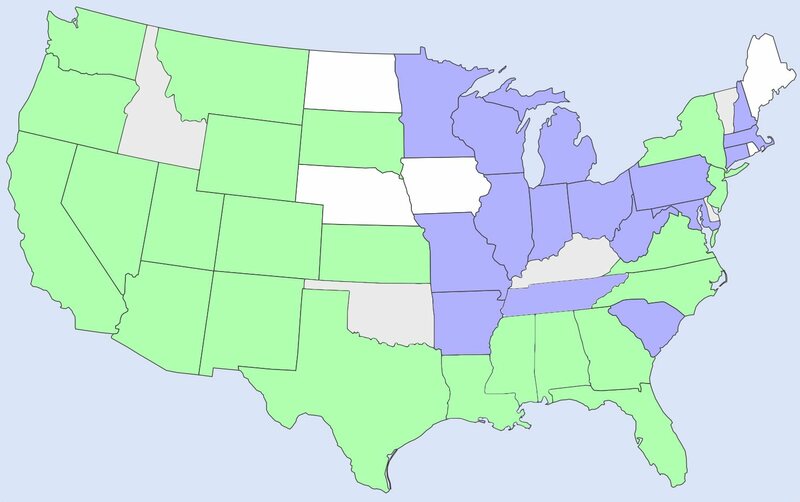 We’re looking forward to visiting Denver again although I think we’ll choose some easier hikes next time. Wow, impressive! Yes those elevations definitely take their toll. Glad you made it and enjoyed Cherry Creek, it really is a great campground. We really loved Cherry Creek, I can see why the reviews are always so high for that campground! 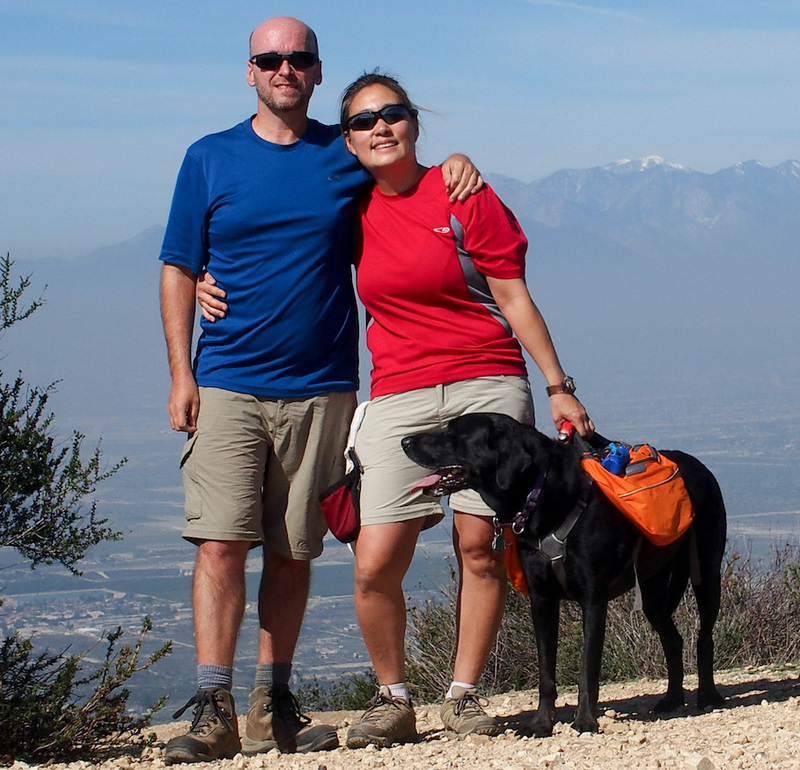 I know you and Mona Liza are avid hikers, do you have any secrets on managing on such high elevations? Love your blog. Fantastic photos. You give my wife and I great ideas for traveling destinations in our 36LA as well, but I have to admit that we’ll just have to enjoy your pics on this hike, because we wouldn’t attempt this hike. Keep up the great work, it doesn’t go unnoticed. Hi Kevin, thanks! It’s easy to take good photos when the views are outstanding no matter where you look! Another Allegro owner, yay! I’m glad we were able to do Mt. Bierstadt but I don’t know if it’s something we’d do again. Glad we could give you some ideas on destinations and things to do! 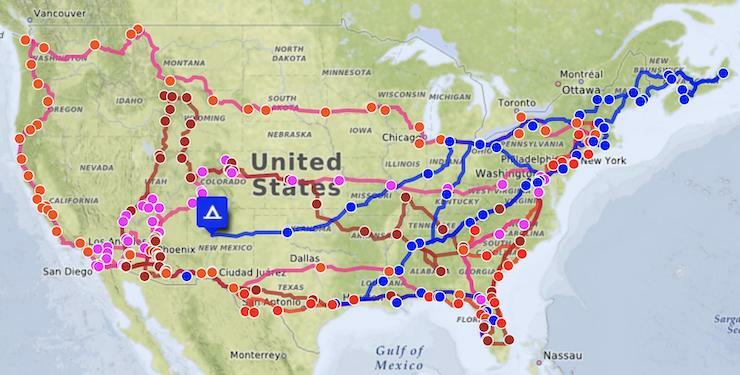 Hope you have some great travels.